25 cool and fresh ways to use peppermint essential oil. Always a favorite during the holidays, once you get your hands on this bottle, you’ll enjoy peppermint essential oil all year long. Check out all 25 uses of peppermint essential oil. 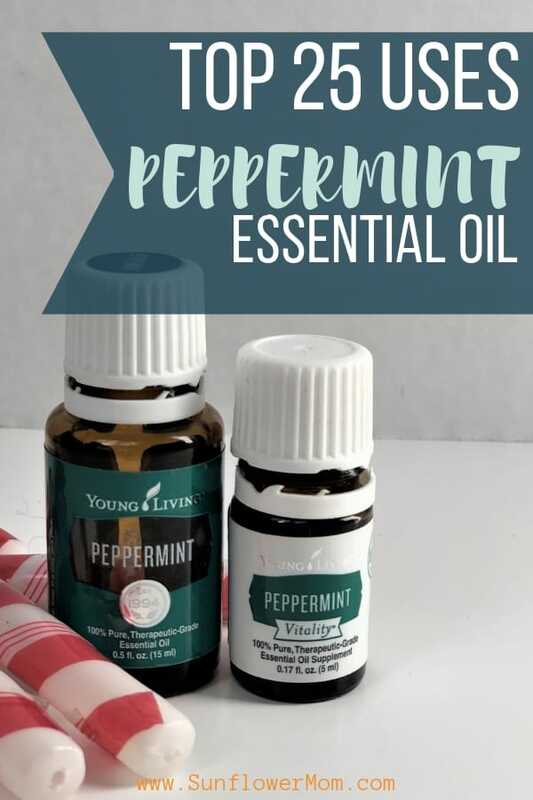 Young Living’s Peppermint essential oil has been widely studied for its potential health benefits and is a favorite for people all around the world. It is also so potent and pure, that only 1 drop delivers the effectiveness of over 26 cups of pure peppermint tea. Peppermint’s primary active component – menthol – is extracted from the leaves and flowering tops of the peppermint plant. Eases occasional headaches – rub on temples and behind ears. Drink a drop in your water or in a cup of tea to reduce symptoms of heartburn. Rub several drops on bottoms of feet, back, and crown if your body temperature is hot. Dilute for children. Rub on joints to relieve soreness. Rub 3-5 drops over the abdomen and around the navel to relieve nausea symptoms. Or try inhaling it. Diffuse or apply first thing in the morning to increase energy and alertness after sleep. I like one drop in my coffee – it wakes me up and tastes better than peppermint mocha from Starbucks. Combine peppermint, lemon, and lavender for seasonal allergies – in the diffuser or combine all 3 into a roller. Sinus support – rub on outside of the nose to help with congestion. Apply before exercise to get you going. It’s uplifting – diffuse with lemon in the diffuser. Bugs do not like peppermint. Make a spray bottle to keep handy of peppermint essential oil and distilled water. Apply peppermint and lavender essential oil on your skin if you got too much sun. The peppermint will cool you down and the lavender will help soothe your skin. Remember to dilute if on children. Add to your water to fight sugar cravings and help with sugar cravings. If one drop is too much then make a pitcher. Add to sugar scrub or body scrub for a cooling scrub. Carsickness – Put a drop of Peppermint on your wrists and behind your ears. You can also get a car diffuser and diffuse this as well. Safe for kiddos who get carsickness as well, just dilute accordingly! *Bonus for diffusing is that it will keep you awake and alert during long road trips. High Body Temperature: Alternate diluted Peppermint and Lemon along the spine, on the bottoms of the feet, around the navel, and on the back of the neck every 30 mins. You can either make a roller up of each or mix one drop of oil with a teaspoon of carrier oil and apply. Hiccups: Simply take 1 drop of Young Living peppermint essential oil, and dilute it with 1 drop of a carrier oil like olive oil or grapeseed oil. You need to dilute it because peppermint is a “hot” oil, and while some folks have no problem applying it “neat” (meaning without it being combined with an oil) many people find it to be uncomfortable because it feels a bit hot. Placing a drop of peppermint on the roof of your mouth this way is also great to clear you up if you are congested or can help with a headache. Massage on feet at night – it’s soothing and will help sore feet. Freshens up a room when diffused. Make a cooling spray for hot flashes. Young Living’s Peppermint Essential Oil is the most popular essential oil available. I’m never without a bottle. You can become a member of Young Living and get all their benefits and a full starter kit or just a bottle of Peppermint when you sign up as a retail customer. Direct link to sign up as a Retail customer and just buy a bottle of Citrus Fresh Essential Oil HERE. There are many other uses for Peppermint essential oil. Share yours in the comments!